Just did these this morning. They're not the best job I've done mainly because I was impatient today and I just wanted to move on to the next nail as soon as possible. So, ended up messing up a lot. I've had this idea for quite a while and though I'm not totally satisfied with the result, it's still nice.. Apply base coat (optional), then apply your colour over. I used one coat then the nail foil and then the next colour coat over the uncovered parts again. Cut out a fitting size of nail foil and paste it on your nail. I just estimated so it's not perfect. I pasted with the long edge first and covered the tips with excess because my tips are a bit rounded, so I needed the foil to wrap around. 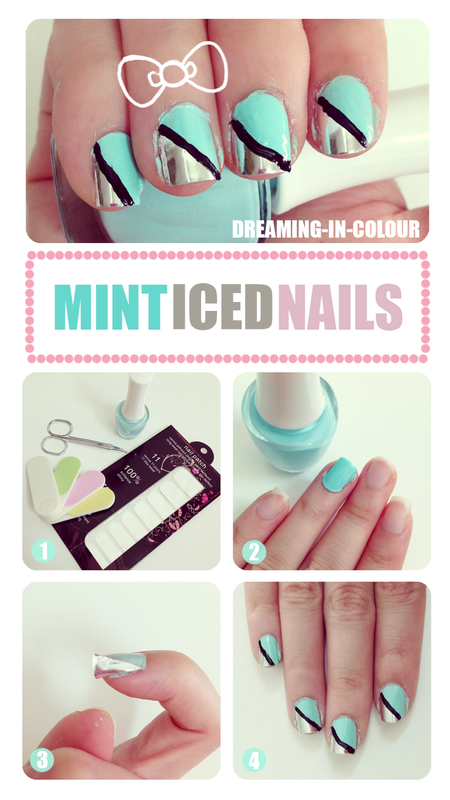 Push off air bubbles and file off the excess like in the previous nail foil tutorial. I put another colour coat on, as I said, then end off with a black line where the foil and mint nail polish meet. Didn't put a top coat on because that would spoil the shiny effect for me. For the first time, my right hand looks better done than my left hand. But I don't think I'll leave them on for long.